M Series Cryogenic Mechanical Crusher_M Series Cryogenic Mechanical Crusher_Kunshan Qiang Wei Powder Equipment Co., Ltd.
2, the working principle: The system for the cold liquid nitrogen source , by cooling the material after being crushed brittle friable state achieved at low temperature, into the cavity of the mechanical pulverizer , high-speed rotation of the impeller , the blade material , gear, material with each other under the combined effect of the material between the repeated impact , collision , shear, friction , etc., to the crushing effect : the material is crushed by a whirlwind of material collected ; fineness of the material does not meet the requirements to continue crushing return silos , air conditioning most of the return recycling bin . 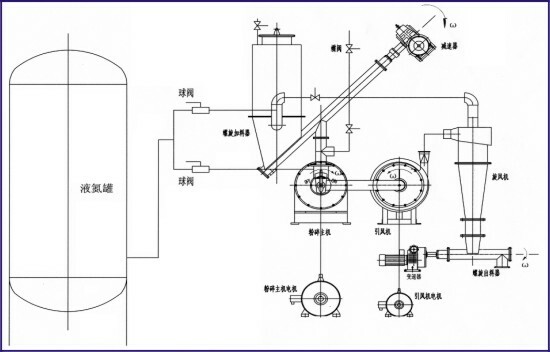 Using liquid nitrogen as grinding media , to achieve ultra-low temperature grinding, explosion-proof materials , such as the combined effect of oxidation . 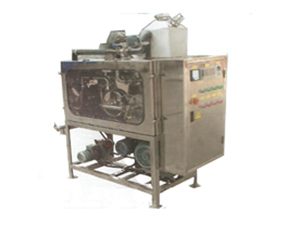 The system is suitable for cryogenic grinding at room temperature can not crush various materials , widely used in chemical , plastic , rubber, thermoplastic materials and other products of ultra-fine grinding .